Dhalsim has been trained by the best Yoga masters since he was a young boy, and is now the greatest Yoga master himself. His great powers are unattainable by most men, and has gained the ability to extend his astral self. Having a great respect for all living things, Dhalsim uses his fighting techniques only as defensive manuevers, and could never permanently harm anyone. He lives in a village in India with his wife, Sally. 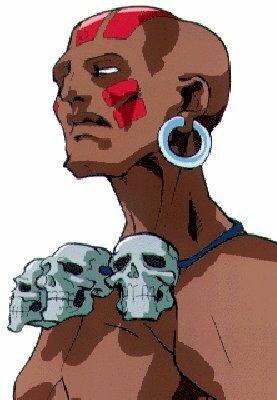 It had never been Dhalsim's intent to become a World Warrior, yet he was forced into competition when his village was struck by famine. He witnessed the unfortunate deaths of several children, and wore their skulls on a necklace to remind himself of his mission. In his travels, he encountered a being of pure evil, once which Dhalsim felt it was his duty to stop. The entity was called Edmund Honda, when suddenly he could not concentrate his attacks. Another person's chi was blocking his, and distracted Dhalsim long enough for Honda to defeat him. Thinking back to his encounter with Akuma, Dhalsim realized that this man was the powerful opposite of the demonic fighter. Dhalsim vowed to keep track of the man whose power was so great. He and Honda conversed after the battle, and it was then that Dhalsim learned of a World Warriors tournament that was being held in Thailand. Realizing that this tournament would be a great opportunity to not only increase his skills but earn more money for the villagers, he journeyed to Thailand to enter the tournament. When he arrived, he found that he was in the company of many skilled fighters. With his Yoga discipline, Dhalsim rose in the tournament standings until he was matched against a fighter named Ryu. Dhalsim was surprised to find that Ryu was the same fighter he had sensed during his fight with Honda in India. Dhalsim had spent a great deal of time honing his skills, and had found a way to neutralize Ryu's chi, making him invulnerable to Ryu's fireball. Ryu had a hard time penetrating Dhalsim's defenses, but eventually nailed him with a ShoRyuKen. The two warriors conversed after Ryu's win, and Dhalsim wished Ryu luck in the remainder of the tournament. Ryu eventually became the champion of the tournament, and Dhalsim returned home satisfied that he had been defeated by such a skilled fighter. Although his journey had ended in defeat, Dhalsim had learned all that he needed to know during his travels, and returned home to his family with what winnings he had earned. Dhalsim retired from competition, and now spends his days as a loving husband and father. shoot fireballs as being a result of the consumption of curry.